I am so excited to be sharing with you my first post of a full company branding experience. Michelle Webber, from 604 Lifestyle Management, contacted me when she heard about me through our mutual friend. She was starting a new company and needed a new logo, business cards, and website. Once I heard a bit more about her business I was so excited to get started on the process. Michelle was an amazing client and was so easy to work with! 604 Lifestyle Management is a full service boutique lifestyle management firm. They do anything from travel arrangements to event planning to everyday tasks like shopping, bringing vehicles in for maintenance, meal prep... and the list goes on!! I was amazed at all of the things their company does. When I asked Michelle a bit more about their company, she said that they would like their logo to reflect a West Coast lifestyle. The West Coast blues, greens, and greys immediately popped into my mind. Because the scope of their business is so broad, the logo had to reflect their wide target audience. So... I put together a mood board for Michelle to make sure we were on the same page. The mood board is an important tool I like to use before beginning on the logo design as it helps me put together images and colour schemes for some inspiration. After sharing the mood board with Michelle, I started on some logo designs. There were three rounds of revisions involved to get the logo just right! Each round helped me understand Michelle's style a bit more and clarify exactly what she was looking for. Michelle decided on the logo above as her final logo. I was happy she chose that one as it was my favourite too! I couldn't wait to get started on her business cards and website now that the logo was complete! The logo process is definitely the most difficult part of the brand experience. For both the designer and the client, it can be overwhelming. The designer has to get inside the client's head and the client has to make sure they are communicating their thoughts properly... or else the process will never end! The client also has to make a tough decision in the end. Luckily, Michelle communicated her likes and dislikes very clearly which helped me understand what she was looking for. I think we nailed down a great logo in the end! When designing Michelle's business cards, I wanted to make sure that I incorporated the same fonts and colours in her logo. It's so important to have your brand be cohesive across all platforms. I presented Michelle with two options and she knew what she wanted! The business card process was so much simpler to create once we had the logo and branding completed. The website was the next hurdle to overcome! Michelle explained that she didn't know much about building websites so I wanted to make sure I chose a platform that would be easy for her to access, as well as one that has great resources for their users. I chose to use the squarespace platform for Michelle's company. It's the same platform I use for my site and I love it! 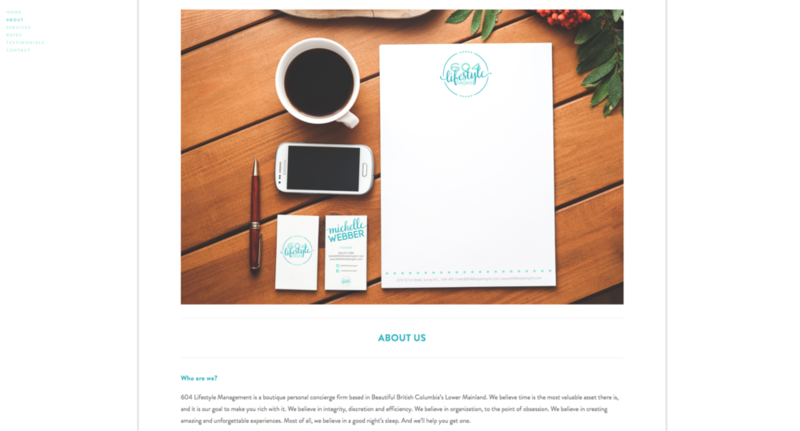 Michelle provided me with the content for her site and chose her template. The design process was smooth sailing for the website and just needed a few tweaks here and there to make it perfect! To get the full website experience, visit www.604lifestylemgmt.com to see the site in action! Thanks for taking a look at this company branding experience! To find out more about 604 Lifestyle Management, visit their website, Instagram, or Facebook page! You can also send them an email at hello@604lifesylemgmt.com! Leave your comments below to let us know what you think of the branding process!